Very neutral and detailed speaker cable, with a realistic, transparent, open and width stereo image! 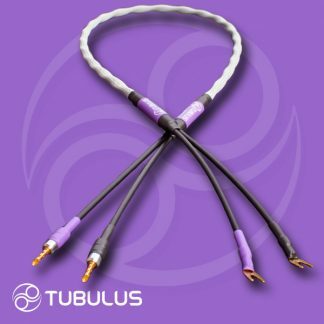 The TUBULUS Libentus Speaker Cable V2 is based on high quality silvered copper conductors. These are solid core conductors and are individually insulated with air, because (except for a vacuum) air is the best dielectric. This air insulation is made possible by our tube construction, which can only be made by hand. Unique speaker cable in this price level! 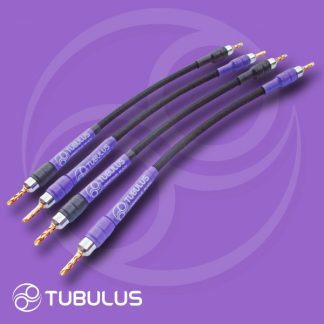 The TUBULUS Libentus Speaker Cable V2 is available with high quality gold plated spades or banana plugs, which are soldered with silver containing solder. 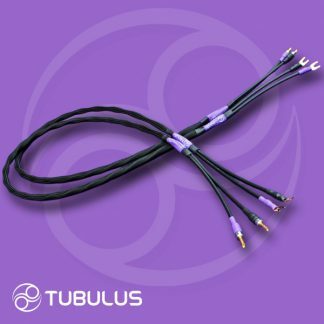 TUBULUS Libentus Speaker cables are hand crafted with love, expertise and devotion with no excess decoration or luxury packaging and therefore true value for your money! WHY WE USE SOLID CORE CONDUCTORS IN OUR SPEAKER CABLES. The use of solid core conductors eliminates the inherent problem with multi-stranded wire. As electrons travel along such a multi-stranded wire, there is nothing to keep them from “jumping” repeatedly from one strand to another. The main problem is the oxide film that covers the metal surface. When it jumps from one strand to another, the signal crosses two oxide boundaries and “jumps” across a thin air gap. This affects the signal passing through it by partially rectifying that signal and thus the musical signal. With multi-stranded silver wire this effect is less pronounced then with copper, since silver oxide is conductive.